Summary: A wounded warrior and his younger brother discover the true meaning of Christmas in this timeless story of family bonds. As far as ten-year-old Miller McClellan is concerned, it’s the worst Christmas ever. His father’s shrimp boat is docked, his mother is working two jobs, and with finances strained, Miller is told they can’t afford the dog he desperately wants. “Your brother’s return from war is our family’s gift,” his parents tell him. But when Taylor returns with PTSD, family strains darken the holidays. Don't hate me for reviewing a Christmas book already, but I did wait until November... and the book did come out last week! 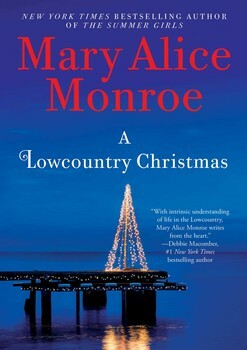 All joking aside, I was very excited to read A LOWCOUNTRY CHRISTMAS by Mary Alice Monroe. I recently met Ms. Monroe at SIBA and I thought she was just delightful. Plus, my good friend Kathy (aka Bermudaonion) has been raving about her novels for years! A LOWCOUNTRY CHRISTMAS tells the story of the McClellan family. Ten year-old Miller knows times are hard for his family. His father can no longer afford to take out his shrimp boat and he's trying to pick up some odd jobs foxing houses, and his mother Jenny is working extra hours cleaning houses to pick up some much needed cash. Miller is desperate for his family to get him a dog, but he's been told that they can't afford the dog never mind the costs of food. His mother feels her son's pain but keeps reminding him that his brother Taylor is coming back from the war -- that's the family's Christmas gift. And Miller is very excited that his older brother is finally coming home; however, the Taylor that comes back isn't the same guy as the one who left for Afghanistan. Taylor was involved in an IED accident that killed many of his men, and he's supposed to be happy that he's alive. However, Taylor is suffering from PTSD, and his many internal scars are taking a toll on his well-being... and his family's. As sad as this story sounds, there is hope in the form of a service dog. Taylor received an amazing dog named Thor to help him with his PTSD. Even though Miller understands that his brother needs to service dog to help him cope with his PTSD, he is still only ten years old... and extremely jealous. It doesn't help matters that Miller's father is feeling inadequate because he can't afford to give his family the Christmas they deserve. Miller has just resigned himself to a horrible holiday season. Until Miller realizes that might be able to make things right if he takes matters into his own hands. He heads out on the morning of Christmas Eve with Thor to cut down a Christmas tree. The weather is unseasonably cold and Miller gets turned around and eventually lost in the woods. Both Mr. McClellan and Taylor must find the strength to put aside their issues and come together to find Miller before it's too late! I adored A LOWCOUNTRY CHRISTMAS. I admit I was a little worried that I wasn't yet in the holiday mood; however, I quickly realized that wasn't the case. I loved the entire McClellan family and their story definitely put in perspective what's important in life. I think I just had a huge smile on my face when I finished this novel. There were quite a few things that impressed me about this book. First and foremost was the writing. I really appreciated Ms. Monroe's prose, and I loved how she decided to tell this story using three different narrators -- Miller, Taylor and their mom Jenny. I thought she did a great job in capturing their different voices; and as a reader, I enjoyed seeing each of their viewpoints about what was happening to the family. I also really appreciated how she took on the difficult subject of PTSD. I think it's probably difficult for those of us who aren't directly affected by PTSD to understand how crippling this disorder is. I found this novel to be enlightening about PTSD while also treating it with the compassion is deserves. Finally, I loved the role of Thor in this story. I have a friend who "babysits" service dogs in training, and I'm always amazed by what they can do. Thor was such a special service dog, though. He could sense when Taylor was starting to go off the rails and gently guide him back. As useful as he was, he also just provided a lot of love and support to someone who was hurting. Animals are definitely amazing! A LOWCOUNTRY CHRISTMAS is the ideal holiday read. It's a sweet story about family and sacrifice, and it also has an animal angle that all of Ms. Monroe's books seem to have. I can guarantee that this book will warm your heart and entertain you. Highly recommended! Thanks to Tandem Literary for providing a review copy of this novel. I knew you'd love this book! I thought it was just terrific and will be posting about it soon. Kid Konnection: Animal & Hockey Books!